In November, I posted about my latest attempt to quit smoking. 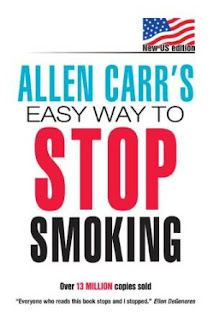 My husband and I went through Allen Carr's Easy Way to Stop Smoking , and at the time of writing I had been smoke free for several days. I was enjoying my freedom but having some unusual side effects, like tingling lips and toes! On the whole, I had quit and was happy to do so! Well, the proof for these quit smoking "miracles" is always time, so now, 4 months later, I want to report the progress that my husband & I have made. As mentioned back in November, I have tried to quit many times and had always failed. I've tried almost everything: every nicotine replacement product, counseling, willpower and even hypnotism. So... I am very very proud to announce that not only are my husband and I still cigarette-free, it's been pretty darn easy! My only regret was not finishing & following this book years ago. I have zero desire to ever smoke, and as Carr said I would, I have really begun to pity smokers. I can spot a smoker from 30 ft, the smell alone alerts me. I pity those standing outside the restaurant in the snow - not because of the weather, but because they are still imprisoned! They can't get through a pleasant evening with their friends without "nipping outside" between courses. Now, I am not going to pretend that my brain suddenly turned into that of a non smoker. I had smoked for 6,500 days in a row. That's 6,500 evening meals that ended in a cigarette. That's 20,000 cups of coffee sipped with a cigarette for company. That's 131,000 cigarettes smoked by me alone, and about 200,000 light ups because I had the habit of smoking the cigarette in 2 halves. So, it was only absolutely natural that after a meal, my hand would reach to the table where my packet of cigs used to sit, or when I picked up the phone to make a call, I'd look for my lighter. The difference between after Quit Day and those 6,500 days before Quit Day was that after QD, I had the tools to help me deal with those trigger moments. So when my brain said, "You're drinking coffee, light up," I was more than capable of resisting, and more importantly ENJOYING the fact that I could resist. There were a few moments in the early days when I had to tell my brain, quite loudly "Would you shut up? I don't smoke anymore." But it's important to realize that I didn't feel deprived and that I understood these were just natural automatic reactions, like putting my slippers on when I get out of bed. Let's say I decided not to wear slippers anymore. For a while, I'd stumble out of bed and naturally try to slip my feet into them. Would I be devastated when I realized I wasn't going to wear them anymore? Of course not! I'd just remind myself, oh yeah, I don't do that anymore! That's exactly how I dealt with those cigarette triggers. Over the months, I've encountered random trigger moments that aren't as obvious as meal time, coffee time or talking on the phone. Getting bad news, dealing with a nasty customer, having a few glasses of wine.... not things that are daily happenings, and therefore can take you by surprise when the old brain tells you to reach for the smokes. I understand I might have these new moments for years, but the important thing to note is that I don't want to smoke, don't like it and fully understand that lighting one wouldn't feel good. I fully believe that what Carr did with his book was to get me to think like a non-smoker. When a non-smoker has coffee, they don't think "Hmmmm something's missing.... what it is? Oh if only I smoked!" And I no longer think I am missing out either! I don't feel deprived. Instead, I feel a sense of freedom. When we go to a restaurant, I don't have to sneak out between courses. Now I sit and enjoy the time with my children. I don't rush from the cinema, or even sneak out halfway through the film and then sneak back in knowing I was trailing fumes behind me. Now I just do what I want to do without the restrictions imposed by the cigarettes. I am not just an ex-smoker as I was on previous attempts, I believe thoroughly than I am a complete non-smoker! This self help book is a 5/5 if ever I read one! p.s. 2013.... still a non smoker :) not a single cigarette since! 2015.... coming up to our 6th anniversary. A happy non smoker, not a puff in 6 years.